← The story of the secret love child from the tunnel… there were eleven babies, not ten, but the last one was German. One of the incredible stories told in my book ‘Fire and Ice’ about the scorched earth burning and evacuation of northern Norway in 1944 is of the flood of refugees descending on the city of Tromso. Some forgotten details of how that human wave was managed are now emerging – again thanks to social media and a network of historians and enthusiasts with access to archive documents. Gunn Nilsen set up a special interest group on Facebook for an inner circle of World War Two historians, enthusiasts and archivists. She has unearthed a dusty copy of a detailed report into the evacuation of the north at one of the museums, and bit by bit she has been sharing it. The orders to evacuate and then burn the north of Norway came from Adolf Hitler himself, and were received by Army generals in Finnmark on October 28th 1944. The aim of the scorched earth burning was to deny the Red Army any possible military advantage in pursuing their withdrawal from the Arctic Front. The population in the north of Norway was estimated at 60,000 people in 1940. Tens of thousands of people were rounded up and shipped south to Tromso – a journey that took at least two days, sometimes more. Incredibly very few people died during the mass evacuation. Historians today reckon 25,000 people fled to hide in the mountains, in caves or on remote islands, but even so, that still leaves 35,000 cold, hungry and tired people arriving in a strange city with nowhere to stay, nothing to eat and no idea of where they are going. When I was in Tromso gathering interviews for ‘Fire and Ice’ I talked to a wartime soldier and later journalist, Gunnar Jaklin, who founded the Tromso Defence Museum. 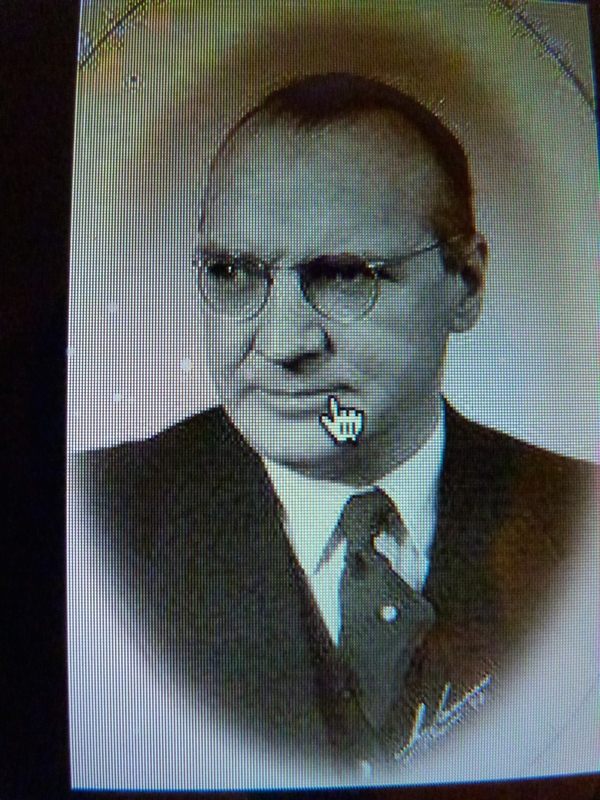 He was an incredible source of stories for me, and told me about the work of a hotel manager called Ragnar A. Hansen who effectively took over the German evacuation plans and made them work. There WAS an evacuation plan, but the people co-ordinating it at first were the ministers of the traitor Quisling, the Nasjonal Samling Hitlerite puppet government. “Tromso was the first passageway for the evacuees from the north. During October, November and December approximately 45,000 evacuees passed through the city. Here each person and vehicle was registered and received instructions on how they could make their journey onto a final destination. Everyone got a bath, a medical, accommodation and catering during their stay. Assembly rooms, churches, town halls and practically every house and apartment in the city was open for our hapless countrymen. “At the time of the evacuation in Tromsø and the surrounding areas [there were] accommodated 15,000 soldiers of the retreating GermanArmy from Finland, besides the regular German garrison of a couple of thousand [troops]. However, closer reading of the original manuscripts reveals some uncomfortable truths, Gunn Nilsen reports. Hansen faced some huge logistical problems, the report notes. 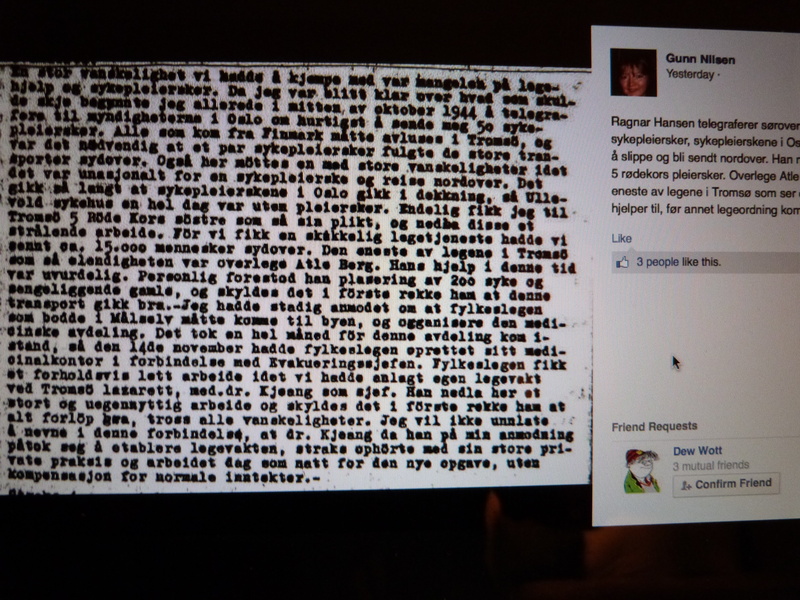 At one point, Gunn writes, he received a telegram saying that within three days 10,000 refugees must arrive in Tromsø. There wasn’t a single boat available for transport to the south. In the photograph below Hansen asked the authorities in Oslo for fifty nurses to help cover the medical need. The nurses in the south couldn’t be persuaded to head north: he got five Red Cross staff. Only one doctor answered the call to help. Another section of the report covers luggage. “There are so many unfamiliar names and heroes that we’ve never heard of,who [did so much] during the evacuation. They helped save a pressed population fleeing [from] a big problem. The Germans estimated 40% loss of life in the evacuation – that’d be about 24,000 people. In fact the total dead reached 1% of that. The NS Minister in charge Lippestad reckoned a 25% loss (15,000 people) would be fortunate. Hansen also highlights those who worked around the clock on the 250 boats and 17 ships that transported people between Finnmark, Nord-Troms and Tromsø, as well as the larger ship carrying evacuees further south. Wartime soldier Gunnar Jaklin met Ragnar Hansen a couple of times but didn’t know him to talk to, as he was an 18 year old private at the time. But he was full of respect for a man who was able to defy both the Nazi bosses and the Quisling party to run this operation. I didn’t know anything about Ragnar Hansen, so I asked Gunnar at one point: ‘Was he NS [Nasjonal Samling]? Mr Jaklin shot me a look somewhere between outrage, shock and incredulity. Wondering if a patriotic Norwegian is NS … is about as insulting as it gets. Now, as Gunn Nilsen posts this report, we will find out just how good a Norwegian he was. I think many people today will find they owe their lives to him. This entry was posted in evacuation, Hitler, Nazi, Norway, tromso and tagged evacuation, Nazi, Norway, Quisling, Soviet Union. Bookmark the permalink.